If there's one thing in this world that I am thankful for, it's that of having a sister. Sure, we used to stage a World War when we were kids to the point of me wishing that I should have been an only child. However, during one of those fights, our mom told me one thing that has stayed permanently in my mind since then... "No matter what happens, the two of you have to stick together because someday, it will just be the two of you against the world. 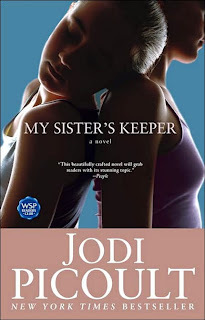 Just recently, I read this novel called My Sister's Keeper it's a story about a young girl named Anna who was born to save her sister who's sick with Leukemia. As her sister grew weaker and weaker, more things are needed from Anna's own body. At a young age of thirteen, she has been through countless surgeries, shots and various medical procedures. Anna had enough, she finally made a decision that might tear her family apart and could lead to fatal consequences for her very own sister. This is one of the best novels that I've read this year. It was so good that I could hardly put it down. I'm so excited that they made a movie version and it will be shown soon! I just hope the movie will do justice for the beautiful story. Don't forget your tissue! I loved this book! :D Haha I read it over summer break! Can't wait for the movie, pero I heard they changed the ending daw :( AWW!